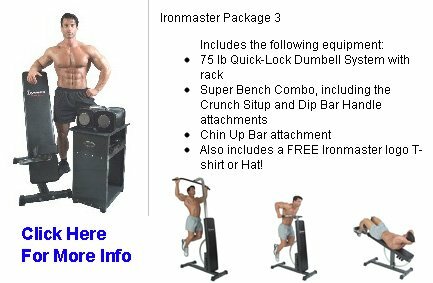 One of my first purchases for my home gym was the Ironmaster super bench along with their adjustable dumbbells. After getting the Powertec rack, I decided I needed another bench for my gym. I wanted the second bench to be heavy duty and adjust to different angles such as a FID (flat/incline/decline) bench. Since I already owned the Ironmaster, I didn't want to spend big bucks on a second bench, so the Body Solid GFID31 bench fit the bill. I started to research the bench, and found it on sale at Amazon for only $175 (now it's $199 including shipping). 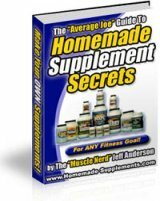 I called the Body Solid factory store to see if they would match the price, which they did. This store is only a one hour drive for me, so to save on shipping charges, I went and picked it up. The Body Solid GFID31 has a 1000 pound capacity, and comes with a lifetime warranty, IF you send the registration card back within 30 days of purchase (which I didn't). Assembly time for the bench should take you anywhere from 1/2 to one hour. Body solid assembly manuals are notoriously bad; no step-by-step assembly instructions, just one exploded picture with arrows and parts everywhere. Here's a PDF file of the manual. But assembling the bench is not that hard. 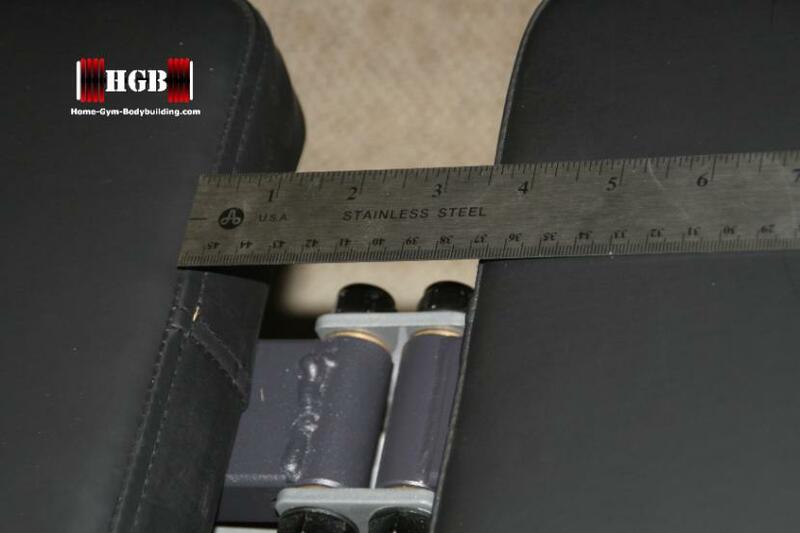 You first assemble the base frame, then you attach the parts where the seat and back pads are mounted, and as a last step you attach the bench padding. The bench even includes wheels for easy mobility. This bench is engineered in the USA and manufactured in China. Obviously they don't have the same quality control that we have here in the USA, because the long bench pad doesn't exactly lay flat. It's very slightly twisted because of the weld. Not enough to make a difference, but when you are paying a good buck, you want quality workmanship. 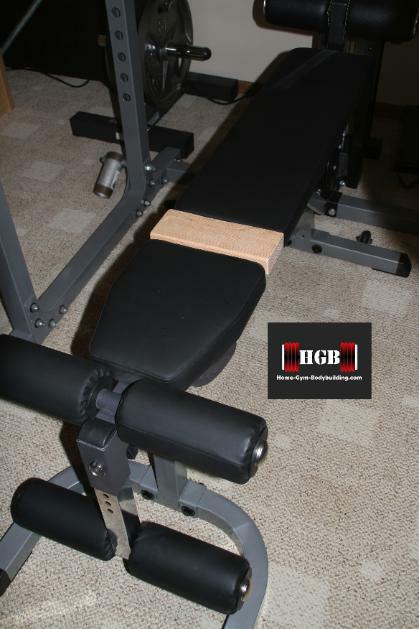 The Body Solid GFID31 bench has only six angle options, and it's very easy to change the angle; just lift the back pad up and the bottom support just swings out of place. The support then just falls into the next angle welded on the bench main support. However, nothing "locks" the back pad into position other than the weight of the back pad. This is a big bench (22"H x 59"L x 27"W) and I like to store it standing up, with the "U" feet straight up. If you barely bump the bench in this position, the bench sometimes collapses because the back pad is not secure in any position, angled or flat. Now I know the bench wasn't designed to be stored standing up, but I do store it this way. 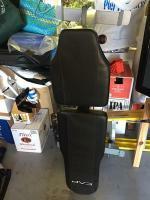 The bench comes with a T-Bar leg hold down attachment for use during declines, and the small seat pad can be angled to match the angle of the back pad. At least the small eight-position seat pad can be locked into any angle. The only attachment I bought was the preacher curl pad. The attachment has a small welded angle where you can rest the barbell. As the weight of the barbell increases, you'll need to place a 45lb plate on the other end of the bench to keep the bench from rising up off of the floor when doing the preacher curl. Not good! 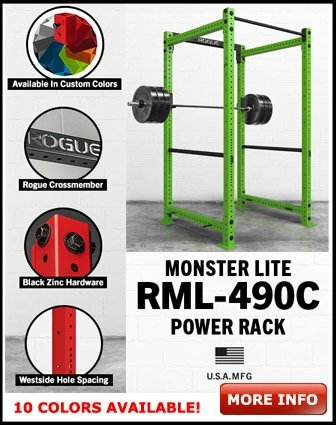 If you have the powertec power rack with the Lat pull down attachment, the Body Solid bench is 2" higher than the Ironmaster super bench. This makes a difference when placing the knees under the pads on the rack to do seated pull downs. With the shorter Ironmaster bench, you have room for your legs and knees under the pads. The Body Solid GFID31 bench is good for a second bench, but not for your primary gym bench. I'm really glad I purchased the Ironmaster super bench as my main home gym bench. It's really not a fair comparison when the Ironmaster costs $269 and the GFID31 is only $175-$199. I guess in the case of both benches, you really do get what you pay for.